The present invention relates to a portable computer comprising a main body unit which forms an image signal by reading and processing data; and a display unit which is plurally provided and has a plate surface displaying an image thereon and overlapping each other to rotate with respect to the main body casing, is detachably mounted in the display supporter, displays an image only on a most front plate surface when mounted in the display supporter, receives an image signal of the most front plate surface and selectively displays a same or different image thereon if it is separated from the display supporter. Accordingly, applicability and convenience of the portable computer may improve. PORTABLE COMPUTER was developed from the idea of pulling out the computer pop-ups into the real world. 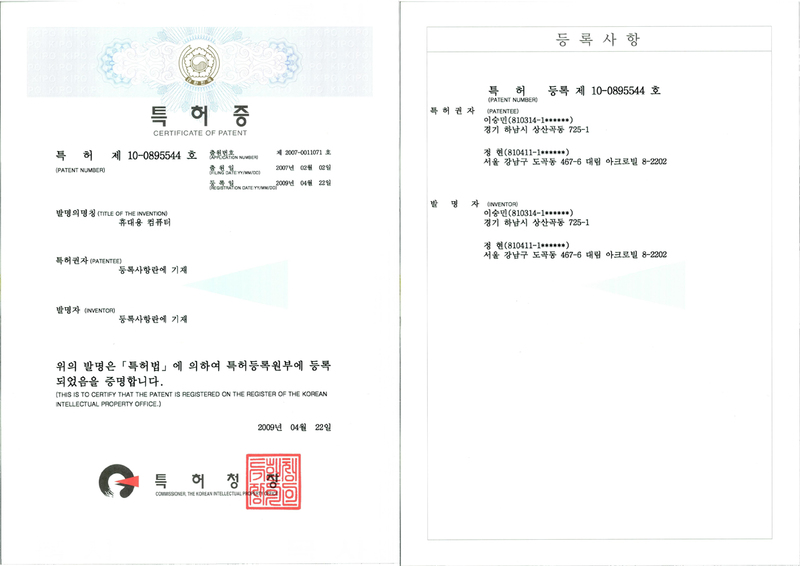 The existing computer OS (operating system) providing more efficient and convenient digital environment for the users, has already been confirmed in the market. The PORTABLE COMPUTER is a concept of actualizing the digital OS in the offline world. The multi-media environment of the design is even more convenient than the limitations of the standard computer/monitor configuration because it expands the boundary of the digital media. The system enables users to share and see the digital contents of one’s computer in an analogue-like form. This idea of expanding the computer interface into the non-digital real world may be a new step of connecting and bringing out the digital interface to the real world. The concept of the design is expanding the idea of pop-up windows into the real non-digital world. 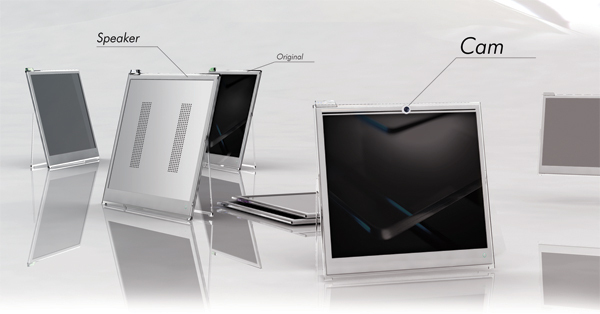 Each layers of thin monitor are linked wirelessly to the main body. Each monitor is a duplicated form of sub-monitors and its system can cross over the barriers of the conventional computer environment that we are so used to. A user can operate the product on the desk of his office having each of his sub monitors displayed at the same time, just like the typical PC interface. It is possible to have many programs operating at the same time in each page of monitors. However, the product expands the boundaries of a normal, single monitor-based Windows interface. This design is truly innovative since it can be applied to various fields of professionals: the working atmosphere of designers who work while having various windows open, a business office, classrooms for educational purposes, and those in marketing. Through this PC design, user can also share a great quantity of information in offices and schools without copying or printing out anything. By simply detaching a page or the monitor from the main body and handing it out to others, you will be able to share your information. Until now, innovations in computer systems have consistently pursued the convenience of the users. The Windows interface, in which it is possible to activate various programs simultaneously, brought about a large innovation for the computer OS (operating system). It provided a friendlier computer environment to approach for customers. This PC design takes the next step, showing an example of applying the development type of the existing software directly into the hardware itself. The function of dragging out or popping up the windows to the outside world of a monitor and turning them into an analogue-like form can provide a truly hands-on experience for users of the product. The sharing of multiple forms of information using images and sounds is now not only conducted online but can be done even in offline simply by handing out a page of the monitor to others. It is a new form of communication, where information and media may be brought to life through the design. This PC design is innovative because it makes use of today’s PC technology in a manner which has not been done before, and this can open up a new era of communication culture. The Portable Computer, composed of the body, main monitor and several sub-monitors, is centered on ‘wireless ultra-thin monitor technology’. One of the ways to make the monitor ultra-slim is using OLED (organic light-emitting diode) technology. The wireless multi-monitor technology through transmitter-receiver also plays a critical role. These technologies allow the users to open and extract window pop-ups from the original screen into other wireless sub-monitors. In the same way that we open and drag windows in the online world, the Portable Computer elevates digital communication into a level of direct communication once only possible online. For the charging method, it uses an organic electro solar cell charger. Although each separate monitor is primarily solar powered, it is also possible to charge by connecting it to the main body. The main body, too, is equipped with a solar panel to be solar charged and can also be charged through a plug-in system. What is more, the OLED monitor display consumes a small amount of electricity since it does not have a separate backlight. Thus, in most circumstances, the ‘Portable Computer’ can be operated on solar-power alone.